I remain totally fascinated with the absolute consistency of supermarket eggs. The size question is understandable, due to stringent grading practices, and of course, the formidable attrition rate that sees a large percentage of eggs being just not up to scratch. No, the bit I don’t get is the amazing consistency of colour. They are either whiter than white, or the most unbelievable shade of orange-ish brown – neither of which you ever see in the great outdoors of backyard egg production. Why is it so? Obviously it requires a much younger brain than mine to work out why our youngest layers have our same old-fashioned ideas about these matters. 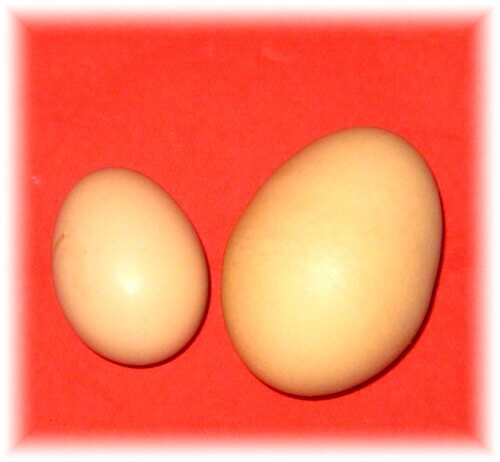 Will you just look at these chook eggs – talk about the large and the small – and blessing them all. We have all brown chooks – probably not pure Rhode Island Reds, but proficient and happy ‘girls’ who produce their beautiful eggs from a combination of locally bought grain, layer pellets (for some necessary mineral and trace elements), free-ranging over a lucerne paddock in the day, pecking away at cuttlefish shells we collect at a nearby beach when we are there (for stronger egg shells), and demolishing all my various veg scraps. From this worthy concoction a happy range of fawn to strong brown shells are created and a range of sizes, also. Every now and then we get a whitish egg for some reason – but it’s more like an incredibly pale fawn really – never the bleached white looking offerings at the shops. Most importantly, the yolks produced from these sweet old-fashioned ‘chicks’ are so yellow you can feel their goodness – ‘sunnyside up’ takes on a whole new meaning with these eggs, like a ray of sunshine in every serve. One of our customers took a dozen eggs to her ageing mother in the city, and luckily was there when the old lady was about to throw them all away after she broke a couple and found them impossibly yellow. 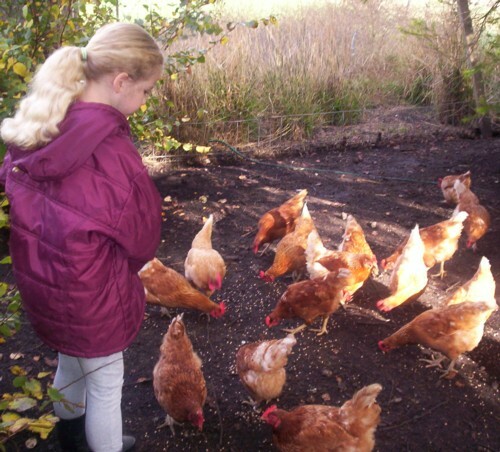 It had been so many years since she had seen a ‘real’ farm egg, she thought they were off. Customers? Yes, we sell our eggs with just a roadside sign, and the ‘honour’ system of paying – namely a container on the tabletop in our garage with a bit of change, and cartons of eggs in a wall cupboard above. The good news is that we have only once had money and eggs stolen, and that was in the first week or so – some 10 years ago. Most of our customers are locals and also regulars, with some making forward orders for the coming week, or phoning us first to see what’s available. It all really started because we had to many eggs for just the two of us to cope with – and has absolutely snowballed. You can guess, by the photo above, which eggs I get these days – the ultimate ends of the size range – plus thin shells, or pimply ones – and need I tell you, all the ‘old wrinklies’, of course! I don’t complain. In a pan, or in a cake, or in the mouth in any shape or form, they all taste equally delicious. And when our special angel comes in with a hand behind her back, saying – “Guess what Gran? I’ve got something SO special just for you!” – I know one of my most favourite things is coming my way…from one of my most favourite people in the world. We stayed in a small village near Bath in England over Easter weekend, and the owner of the cottage brought us some farm fresh eggs. 2 of them were pale blue, and the yolks from all of them were a deep orange colour, not the paler colour you find with supermarket eggs.